Verbier ski storage at Les Ruinettes is the most affordable and most convenient storage option in the resort. Store everything from your skis and boots overnight and your bags and shoes during the day at Ski Service Les Ruinettes for just 5 francs per day. Storage is free for existing Ski Service customers. Storage is also available at Ski Service Verbier and free for all our customers. 5 francs a day is the cheapest Verbier ski storage rate. For this price we clean, spray and dry your boots as well as store your skis in our secure ski storage room. All of this right where you need it, in our unique mountain-top shop at the top of the main lift, Ski Service Les Ruinettes. Ski storage here is particularily popular for the first and last months of ski season when the thin snowpack means the slopes down to Verbier are closed. So if you are taking the lift up and down the mountain everyday why not save your self the carrying and leave your gear with us. Secure lockers are available to rent for the season at a cost of CHF 150 and include a free full service on your ski or board as well as the use of the boot dryers. Store all your equipment at Ski Service Les Ruinettes for just 5 francs a day or free if you rent with Ski Service. Better than cheap, how about free storage? For anyone that has rented equipment at Ski Service Verbier or Ski Service Les Ruinettes, no matter how big or small, storage is completely free at both these locations. If you have hired equipment with Ski Service and your partner, other members of your family or group have not they are also more than welcome to store their skis boots and any other gear they may have for free as well! Ski Service Les Ruinettes is the only Verbier ski storage option located right on the slopes. The top of the main telecabine, at Les Ruinettes, is the perfect place to store your skis and boots. You can travel right up into the ski area in the comfort of your everyday shoes and without having to carry your skis or board around. Read a customer review of storage at Les Ruinettes and a review from another happy customer here. Simply exit the lift at Les Ruinettes make your way into our shop and let our staff help you slip into your warn and dry boots whilst we also fetch your skis from our locker room. So whether you are staying in Verbier or Le Châble, no longer will you need to lug gear around town, into the bus and through the queue at the lift station. 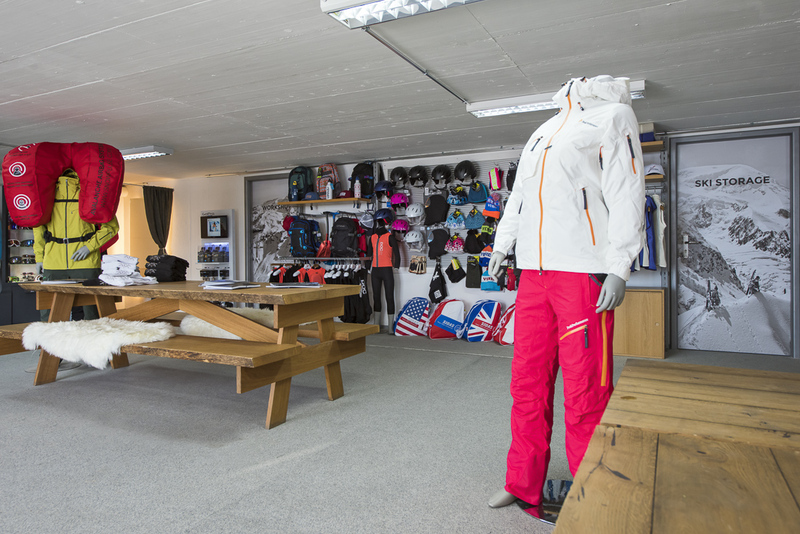 Ski Service Les Ruinettes is Verbier's one and only mountain top shop, located at the top of the main lift. Secure lockers for skis, poles, boots and bags are available at Les Ruinettes to rent for the whole season and cost CHF 150 per person, this price includes a free service. This is especially convenient if you are staying in Le Châble or anywhere else in the valley. You can simple bi-pass Verbier and store everything you need right on the slopes. What do skiers say about ski storage at Ski Service Les Ruinettes? Rent, service and store all your equipment at Ski Service Les Ruinettes - book online to save up to 20%. Get directions to Ski Service Verbier - located in the heart of Verbier at 1500 meters. 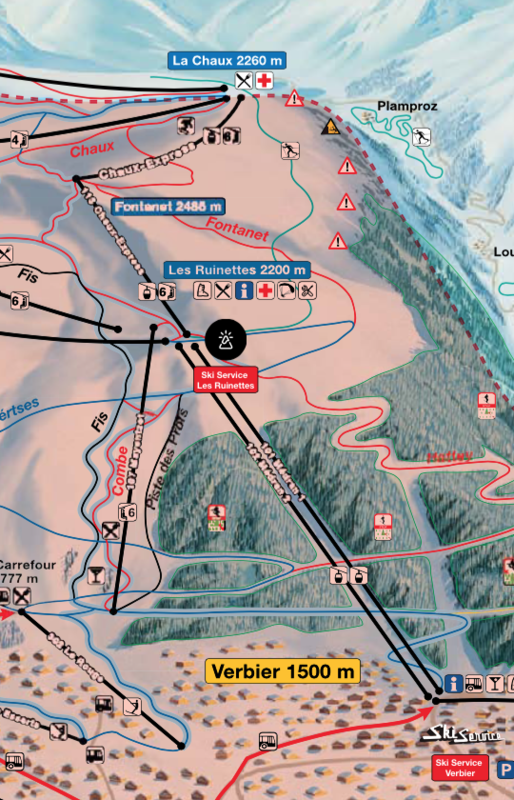 Get directions to Ski Service Les Ruinettes - located at the top of the main lift at 2200 meters.